We have a lovely selection of luxury dog jumpers to keep your dog nice and warm. Some of our dog jumpers, made by Alpaca Pooch, are made from super soft British alpaca fibre. We also have some classic roll neck dog jumpers by Mutts and Hounds in a selection of gorgeous colours. Make sure your dog is nice and warm and cosy this winter in one of our luxury dog jumpers. Dog jumpers need to be both warm and stylish as well as fitting perfectly. At Chelsea Dogs we have a selection of luxury dog jumpers from top designers including Bowl and Bone, House of Paws and Sotnos. 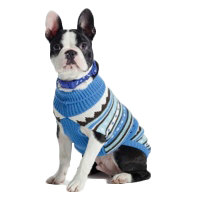 Our most popular dog jumpers are the classic cable knit turtle neck sweaters which are available in a choice of stylish colours. Keeping your dog warm is essential for some small dog breeds like Chihuahuas and dog jumpers should not just be used as a fashion accessory to dress your dog up. Short-haired dog breeds need extra warmth in the colder months so browse our luxury dog jumpers to find the perfect match for your dog.